Monte Carlo is what it is. A glittering, glamorous jewel on the Mediterranean coast, or an enclave of tax avoiders crammed into multistory flats. Take your pick, somewhere in the middle is the truth, but a visit to Monte Carlo will never leave you indifferent. Like it or leave it, Monaco (Monte Carlo is just one segment of this tiny Principality), which houses the most exciting Grand Prix, is well worth a day or two to explore. You might even win at the casino. You can walk across Monaco in less than an hour, (the Monte Carlo bit takes about 20 minutes). On the way, you’ll be passed by every supercar in the world and look down on a harbour where the boats costs as much as houses. Large ones. There’s an old town worth exploring, but most people seem to want to hang out in Place du Casino, where gold Rollers nestle up to each other, their discreet chauffeurs patiently awaiting the emergence of their gambling charges. The square shares poll position with the quayside on cost, with cafes and gelateries in both charging all but €10 for a coffee or ice cream. There’s one thing you can say about Monte Carlo without fear of contradiction: It ain’t cheap. Once you are already in Europe, flights to Nice are plentiful, all year round several times a day. Easyjet’s schedule has dozens of flights a week from up to ten UK airports. Once on the Nice airport you’ll be tempted by the helicopter service, straight to Monte Carlo in 6 minutes flat, but that costs €120+ per head, while a cab is about €90 for up to four. Once in Nice, public transport is surprisingly good. A 20 minute express bus from the Terminal to Nice Station, followed by a 30 minute train ride takes you straight into the heart of things. Monte Carlo’s station, hidden deep underground, emerges at three levels. A cab from any exit to your hotel is €10. Amazingly, the local bus from Nice to Monte Carlo is just over €1. And buses round here are never grotty. If you’re in the UK, the train, using Eurostar to Lille, can be done overnight, arriving just in time for breakfast, or via Paris taking all day. There’s little to actually ‘see’ in Monte Carlo, but there’s plenty to gawp at. The harbour is forever busy, and there’s always a magnificent yacht or two standing out from the crowd. There will always be millionaire boy racers in the world’s fastest supercars. Sitting in the traffic. Monte Carlo is one of the seven wards that make up Monaco, and while everyone speaks French it isn’t actually part of France. The incomers – nearly 90% of the population – aren’t here to assimilate themselves with France, they’re here to pay less tax. Individuals in Monaco do not pay any income tax. In Spring, there’s an Arts Festival to stimulate the mind; in summer the local Philhamonic play, in winter the clowns arrive for the International Festival of Circus. All year round the main draw is the Prince’s Palace and State Apartments which are open daily. Changing of the Guard is at 11.55am. But most people come to wander and stroll around town, enjoying the idea that one day they might just end up living here. Having won the lottery of course. Wandering around Monte Carlo has its rewards, during the day and especially in the evening. The Weekender was strolling around Place du Casino and heard someone singing an Elton John ditty. Turned out to be Sir Elton himself, entertaining a private party who had flung open the windows for all to enjoy. Le Casino is worth a visit and costs €10 – you must have photo ID – it’s belle epoque grandeur now housing a smaller number of punters on roulette, blackjack, and a sea of slots, in the Salon Ordinaires at least. Private gambling is behind closed doors. In the balmy evening air outside, it’s tourist central, with everyone snapping the opulent cars and their mostly anonymous occupants. Well, if you’ve got a brand new half million Ferrari where else is there to park it? Walk further afield, and Monaco’s other segments are as interesting, if not quite as ostentatious, as Monte Carlo. The area above the harbour is called La Condamine and among the yacht chandlers and jewellers there’s actually a decent array of shops bordering the market. 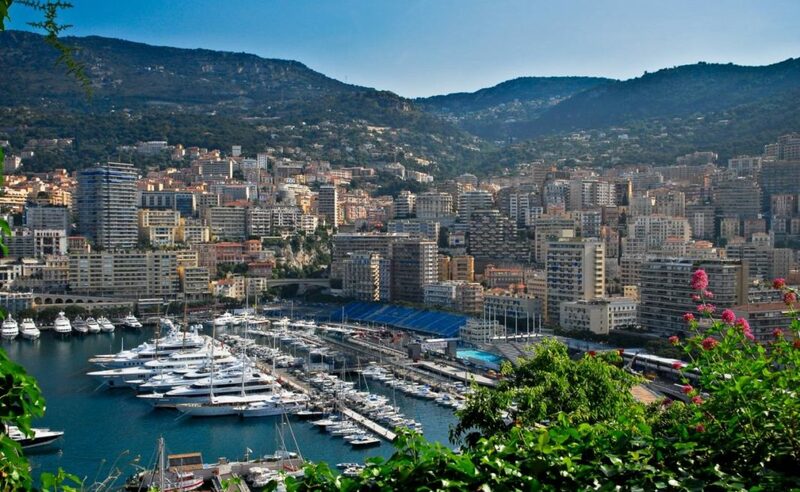 Follow the harbour around to Monaco-Ville and you’ll pass the Prince’s Palace, and beyond to Fontvieille built mostly on reclaimed land housing the heliport, the sports stadium and the Columbus Hotel, a modern addition where David Coulthard is the face to watch out for. He apparently owns some of it. The walk back can be shortened by using the bateau bus, which operates across the mouth of the main harbour (Port Hercule) and costs a Euro each way. A half hour train ride along the coast will bring you over the Italian border to Ventimiglia which houses a HUGE market every Friday. Do not even THINK of going by car, as the traffic to and from all day is horrendous. Once famous for selling more fake goods than anywhere outside Asia, it’s a source of fantastic Italian foods, clothes, shoes and everything else you can think of. Fake Goods are no longer advertised as being on sale. Because that would be illegal. Despite the influx of casually dressed daytrippers and weekenders there remains a stiffness about Monte Carlo’s best hotels. They tend to require jackets and a great deal of nodding goes on. But there is a notable exception. The Fairmont Monte Carlo has set its stall out as the cool alternative for a younger crowd. Hidden behind the Casino, this used to the Loews, then The Grand, but has been spruced up by Fairmont’s Canadian experts to offer a stay in Monte Carlo that is memorable for all the right reasons. The rooms have sea views from large terraces where you can stroll at any time of the day or night. The general theme is a kind of well-heeled Mediterranean Cruise, there are even portholes on the doors, but without the captain’s table or the dreadful guests. The decor expresses the theme well, it’s more nautical, more Riviera chic, than anything else you’ll find in town. There may be 600 rooms here awaiting business travelers, but the muted turquoise, greens and blues of the sea definitely say ‘holiday’ rather than ‘make that call’ And everything is ecologically sound, recyclable, sustainable; the Fairmont’s ‘green’ philosophy applies throughout the entire hotel, their motto being ‘chic & ethic‘. Upstairs on the roof is one of Monaco’s coolest destinations: The Pool. This is hang-out central where gold D&G trainers and personalised Blackberries are de rigeur. Well, this year anyway. Svelte, evenly tanned bodies litter the loungers, couples occupy the ‘love bubbles’ staring out to sea. It’s one of those places which is just right, and despite being just a gold dubloon’s throw from the traffic crawling round Place du Casino, is entirely private. The Fairmont’s killer feature is however the restaurant deck up top, where a terrace stretches the entire length of the hotel and overlooks nothing but the sea and it’s distant horizon. Hot and cold running staff (are they all good looking?) bring smoothies and champagne at any time of the day or night, where breakfast is an event, a full on international buffet in the sun, and dinner (see below) is just Totally Fabulous. The rooms are all fully modernized, wifi equipped with flat screen TV’s and private sun loungers for those days you just cannot make it up to poolside. Beds are comfortable, linens crisp and smooth, bathrooms luxurious. The staff downstairs in the lobby are trained to deal with the most awkward of business travelers so a weekender asking the odd question is always dealt with charmingly. “Minibus to the beach? Certainly madam, two minutes”. Oddly, the building was once the site of Monaco’s railway station, then a clay pigeon shooting gallery for aristocrats (out towards the sea!) before the hotel was constructed in large, drop-in sections. It’s been reformed, adjoins the casino and is run by people who love the hotel business. It’s not cheap, (who told you anything in this town was cheap?). LET’S DO LUNCH. What to Eat? Ironically, the French supermarket chain Casino has the only harbourfront store in Monaco. Sandwiches, drinks, fruit and salads hover around normal prices. Otherwise walk up the hill from the harbour (Rue Princesse Caroline) towards the open-air market for snacks and cafes aplenty. Rue Princess Caroline houses a large number of small restaurants, all fairly pleasant and bordering on chic. Most of them do a very pleasant menu formula with salads, and one or two other courses for about €20 a head including wine. At night, the whole place switches to Specialities Marocaines and the mood changes accordingly. Over the road, on Rue des Orangers is Pasta Pasta, which does what it says on the tin. In the stratospheric, heady world of Haute Cuisine, there’s one French Chef who has amassed more Michelin stars than anyone else. Gordon Ramsay’s declared hero, Alain Ducasse, has interests around the world but his flagship is in Monte Carlo, at the Hotel de Paris, the Louis XV Restaurant. A dish of Provencale Vegetables will cost you €80. Are you Ready for some Formula 1? For one day a year Monaco is totally transformed. The world’s greatest Grand Prix comes roaring into Monaco, with Formula One cars screaming round town, flashing through traffic lights, breaking rules of gravity on hairpin bends, the tightest of which is now The Fairmont’s very own. Known for years as Loews Hairpin, the road (see picture) twists around a turning circle difficult enough for normal driving, but nigh on deadly for Formula One speedsters. The Fairmont rooms which overlook the bend are available for the day, security prevents overnight accommodation, to watch close up the world’s fastest drivers jam on the anchors just for you and your guests. It is the ultimate hospitality dream for petrolheads, just feet from the action, giant screens capturing the rest of it live. It makes The Mount Stand at Lords or Centre Court at Wimbledon look positively tame. Prices on application to Fairmont Hotels, but given the fact that George Lucas, of Starwars fame, is a regular guest, don’t expect the word ‘expensive’ to cover it. Oh, and have a drink – anything really – while you’re there. A table at the Fairmont’s L’Horizon on the 7th floor is a very pleasant place to be. As the sun goes down, the view over the sea is to die for, the private yachts of the global super-rich who didn’t make it into the harbour that day are yours, to be studied in the warm light for decisions to be made about which one you would have and those you wouldn’t. Elegant tables stretch along the deck, candlelit and romantic, while the DJ in the corner keeps the buzz alive. All along the Cote d’Azur restaurants border the sea but have a traffic jam separating them from the waves. Not here, it’s you, the sea, the night air, and the food. Which is a delight. Don’t expect corporate dining, the dreaded international cuisine of large hotels. The Fairmont has its own garden, grows its own fruit and vegetables, and Executive Chef Maryan Gandon, originally from Normandy, informs his menu with a mission statement that goes well beyond the norm. “….fresh and nutritionally balanced ingredients…. optimal health and wellness….locally sourced, organic, sustainable. All cuisine is prepared without artificial trans fat”, OMG – it’s good for you! The dinner menu starts with a list of vegetables in season – in summer there were 22 fresh from their own garden or the local market – and they’re given star treatment throughout. Stuffed Zucchini, cooked and raw asparagus, roasted tomatoes, sunny vegetable gazpacho are just for starters. The fresh pasta dishes with salads, baby squid, clams, whatever, are light and delicious, the grills and spit-roasts seriously meaty and tender. But it’s the fish and shellfish that are worth the detour – gilthead, sea bass, scorpion fish, whatever is in season, whatever has been caught locally that day. Simply grilled, roasted or pan-fried, with salads or fresh green vegetables, the ingredients are the stars. The young sommelier knows his stuff and will recommend young fresh and fruity roses from local producers if that’s what you feel like. If you’re pushing the boat out, he’ll draw your attention to the serious end of the carte. The preparation and service, like the work of all true craftsmen, is barely noticeable. Until, by moonlight, one reflects on just how good it all was, just as the tender whisks one out to that dreamy yacht, selected over the champagne cocktails.